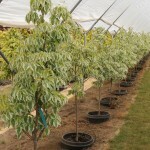 A small upright tree with beautifully colored variegated foliage. 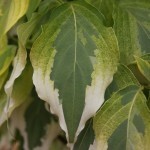 The leaves are green and white dappled with some gold at the base on new growth. Bright red fall color. Creamy white bracts appear in the spring. 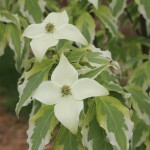 Prefers sun or part shade and needs well-drained soil. PP 20,008.